We pride ourselves on our loyal customers and will work hard to ensure you’re one of them! I priced a slew of competitors against Colorprint, and they came out with the best prices. Combine that with fantastic customer service, quick turnaround, and one-stop shopping for printing and mailing (with discounts), and I'm a happy customer. I used to use Staples and Kinkos for our printing. We would do a couple thousand color flyers a couple times a month, plus our business cards and stationery. I got a referral to Colorprint and what a difference. Way lower price, great service, free delivery, and I work with the same nice folks every time. We do want the job done right and on time every time we make a promise to a client. 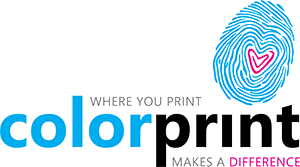 I can tell you Colorprint is reliable and trustworthy no matter how big your business. We are so thrilled with our relationship with the team at Colorprint! They are attentive to details, efficient, and really supportive. The turn around time on our projects is always extremely quick! Using Colorprint as our printer, mailhouse, and designer has saved us money, a ton of time, and a lot of frustration. I highly recommend them!! The team at Colorprint is courteous, knowledgeable and fast. They take responsibility for meeting deadlines and do the job right the first time.